Coca Cola has brought us more than its fair share of pleasure over the years, but we're pretty sure that it's never saved anyone's bacon before – something that's about to change in Japan. 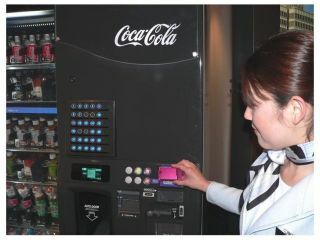 The fizzy drinks giant there is currently setting up a high-tech vending machine that is supposed to offer reassurance and keep an eye on the mean streets for criminals and their goings-on. Not only does the machine sport a webcam that scans the surroundings and records everything it sees, but it also contains a phone with a hotline to the local cop shop in Toyohashi, western Japan. The thinking behind it is that the camera acts as a deterrent to casual street crime and the phone as a reassuring quick link to help. If the first trial is a success, more machines are planned for the rest of Japan. It's all very well, but we can't help thinking that all the camera will see is scenes of bloody murder as perps catch their vics as they mess around with a Coke machine instead of just running away.